The Megalithic Passage Tomb at Newgrange, in Ireland, was built about 3200 BC. The kidney shaped mound covers an area of over one acre and is surrounded by 97 kerbstones, some of which are richly decorated with megalithic art. The 19 metre long inner passage leads to a cruciform chamber with a corbelled roof. 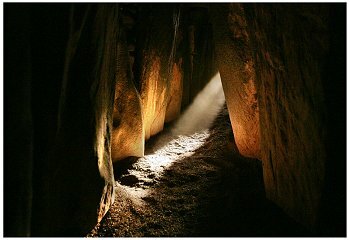 It is estimated that the construction of the Passage Tomb at Newgrange would have taken a work force of 300 at least 20 years. 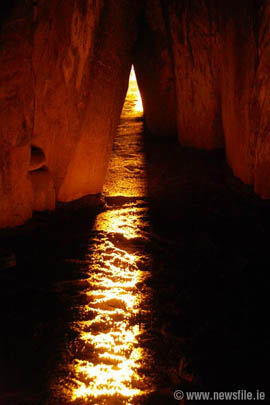 Admission to the Newgrange chamber for the Winter Solstice sunrise is by lottery, application forms are available at the Brú na Bóinne Visitor Centre. For the 2010 draw 25,349 applications were submitted. In September each year, 50 names are drawn with 2 places are awarded to each name drawn.